In this primarily indoor, informal environment, serving customers’ needs fast is critical. Our CLP and CLS Series of radios provides for a higher level of service, but additionally, creates a more safe and secure environment. Shoplifters think twice when instantaneous communications are on the premesis. 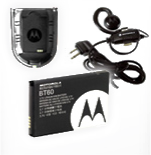 Think Motorola’s CLP and CLS Radios for your retail environment.